Sealed Apperance: Always in it's released state. It is unknown what the blade looks like in it's sealed state or what it's rank would be. A twin set of chained war fans, made out of metal with jewel accents. Long cords attach to her wrists that she can control the length of at will. Shi-kai blade appearance: twin open fan blades with elegant golden metal work, interwoven thru the metal work are small red and icy blue crystals. The cords fall down from the back of the fans to wrap around her wrist and towards the ground allowing her to dance with the blades. Locks in the open postion and can be thrown, the chain attached allows her to control it's movements thru the air twirling it around and in essence dancing with the blades. She can also catch them and hold onto them in her hands fighting in close range combat but it's more dangerous close up then long range. Shi-kai Attack Appearance: The cherry blossoms fly about the perons distracting them even as her fan blades fly in and out cutting the person and knocking them around a little, the vines of ice seem to float in the air. When she closes her fans the vines shatter and the cherry blossoms which are small and razor sharp as well as the ice shards from the vines fly in and add additional damage to her oppent. The amount of damage depends on the length of the dance and how long she was able to go before being forced to close the fans. Shi-kai Attack Appearance: (*note blade does not change*) Closes her war fans, and raises one hand up towards the heavens. Water and ice surge up from the point of the blade forming a icy water dragon, that causes even the sky to darken, and the air to take on a chilling freeze. The second fan closed is pointed towards the enemy, where a wirlwind of cherryblossom petals form flying out towards the enemy becoming a second dragon, together the two dragons swarm the enemy attacking from both sides freezing. Ban-kai Blade Apperance: Her duel fans become one long sword, the blade is such a dark blue it looks black and the air around it is freezing giving off an eriee sort of bluish glow. As the sword moves it leaves behind a trail of frost in the air. The hilt of the sword looks like a icy blue black snow flake with cherry blossoms hanging down form a crystaline thread off of each point. Off the back of the black silk wrapped hilt is a long chain about twenty to thirty links with a pointed crystal off of the back. The attack itself summons a wirlwind of cherry blossom petals around Sakura even as it's freezing the very air around them. As a side note, wounds inflicted by cutting a person with Kurogane Zakurakadoguchi freeze open leaving behind a blue black icy tinge to the area cut. Ban-kai Attack Apperance: During Ban-kai when she chants this release cherry blossoms once again seem to fall from the sky but this time they are swirling around Sakura as well. She brings her sword down from pointing at the sky towards the enemy, and a Dragon's roar can be heard from the quickly crystalizing air. Between them seeming to form at almost point blank range after the tip of her long sword the dragon surges forwards everything in it's pressence freezing solid, even as the cherry blossoms swirl around the enemy in the dragon's wake and shatter covering them in a fine sheen of 'daimond dust'. Against many things out there it is an instant win. However against things of great Spiritual pressure the attack can freeze and leave chilled to the bone, but it would take several times to weaken the others Reiatsu enough to kill them. It would take more then once.. Viazard/Masked~ The difference is the dragon and cherry blossom petals are all black with blue tint as the attack goes off, and the enemy would feel like they are being frozen from the inside out. Ban-kai physical change (if it applies): Her entire outfit changes, and maintains itself depending on the level of Reiatsu she has left. The more badly torn up her Shihakushou gets the lower her Reiatsu is. Her outfit goes from white, red and gold to dark midnight blue black. The coat is simliar in style to Ichigo's as it's caught closed level with her full bust and opens about her navel to fall down in an upside down v. She still has the hamaka pants but they are dark midnight blue black as well. The sleeves are cut short to just below her shoulders with golden trim. The grim goes down the front edges of the top as well down to the hem line and around. Around the bottom hem are large and smaller triangles. The large triangles are facing the right way while the inverted ones are smaller and fit just inside the open space between two larger ones. She has wrist gaurds of the same color. Ban-kai Attack Apperance: The sky goes pitch black, a frozen mist surfaces and expands out freezing solid the ground around in her black ice, lowering the tempature into the double negatives. Behind her enemy appears a beautifuly detailed gate. Large golden supports holding up delicatly detailed doors with fine workmanship of Cherry Blossom trees. Behind Sakura forms a large black ice dragon, it's wings arching into the sky and it's tail wrapping across the ground the dragon and Sakura seem to be one. She's being held by the shoulders in the dragon's talons floating in the air. The gate does not open but seems to fall apart into billions of cherry blossom petals that fly around the enemy even as she moves forwards moving gracefully thru air attacking. The move freezes the enemy solid from the inside out. If struck they shatter into diamond dust. Zanpakuto Soul Apperance: A lovely tall woman in a elegant pinkish white dress that flows to the ground. Long snowy white hair with the same pinkish hues to it and cold icey blue eyes. She looks noble and reagal. She's as beautiful as she is cold. 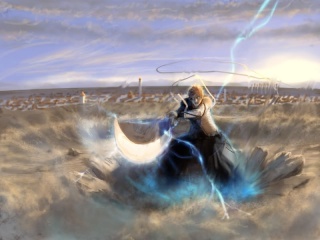 Zanpakuto's Spiritual Realm: (This is your inner souls reflection.) A large field covered in dark blue black snow, it stetches as far as the eye can see scattered thickly thru the field are white bark cherry blossom trees that are in full bloom. Zanpakuto's Persona:Warm only to Sakura her loyalty is to her alone and will think nothing of shredding apart anyone or anything that threatens her. A cold and beautiful Zanpakuto she often offers pearls of wisdom and offers advice and guidance to Sakura. Zakurakadoguchi will 'self' activate if Sakura is in danger and protect her with a wirlwind of cherry blossom petals shredding only those close enough to harm her if she's is knocked out or hurt. Zakurakadoguchi has no problem talking with Sakura at any given point in time but most of the time remains quiet unless Sakura askes for her oppion or help. Shinigami/Zanpakuto Relationship: Strong and stable.